I can cook and click. I can cook, click and feed. I can cook, click, feed and talk over the phone. But I cannot cook, click, feed, talk over the phone AND fight at the same time. 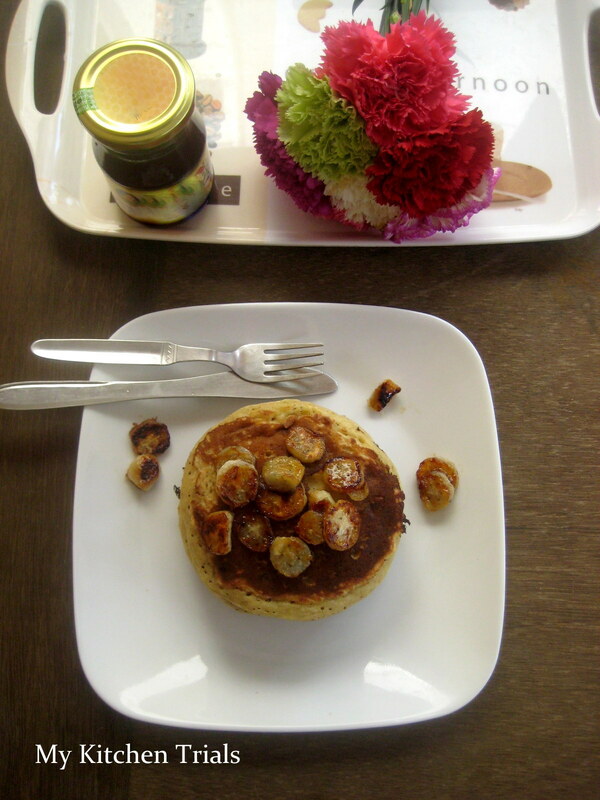 So our breakfast this morning, whole wheat banana pancakes, is going back to the dining table where a hungry hubby and a grumpy kiddo are waiting anxiously. Combine the flour, sugar and baking powder. Whisk. Combine mashed bananas, milk, egg and oil. Mix thoroughly. Stir the dry ingredients to the wet and mix. The batter was slightly watery, so I added about 1 tbsp of flour to it. Heat a frying pan/tawa and add 1/4 cup of the batter. When bubbles start appearing and the batter starts getting dry, flip over and cook. 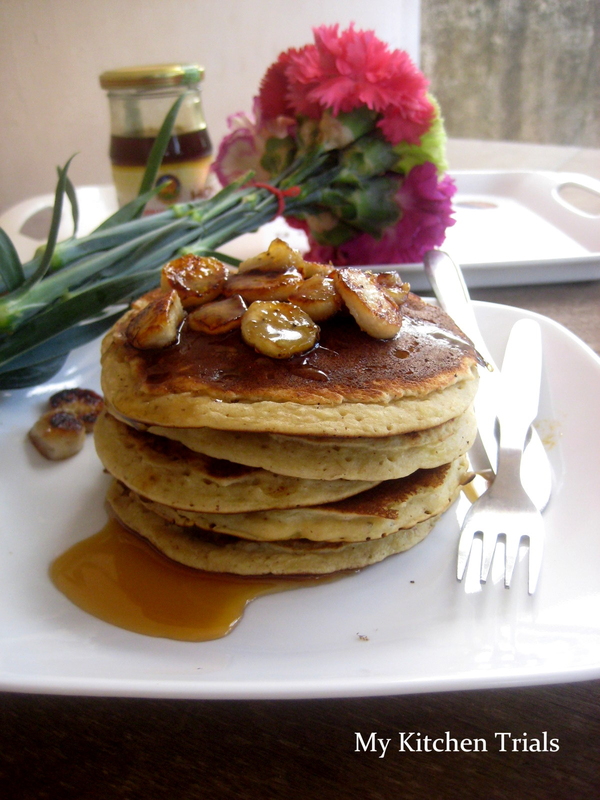 Top with caramelized bananas and serve hot. Lovely Rajani, short and sweet. The pancakes are looking awesome and the prop as always are super. Nice!!! Is that honey you’ve drizzled over the pancakes or is it the caramel? Whatever it is, it looks delicious. 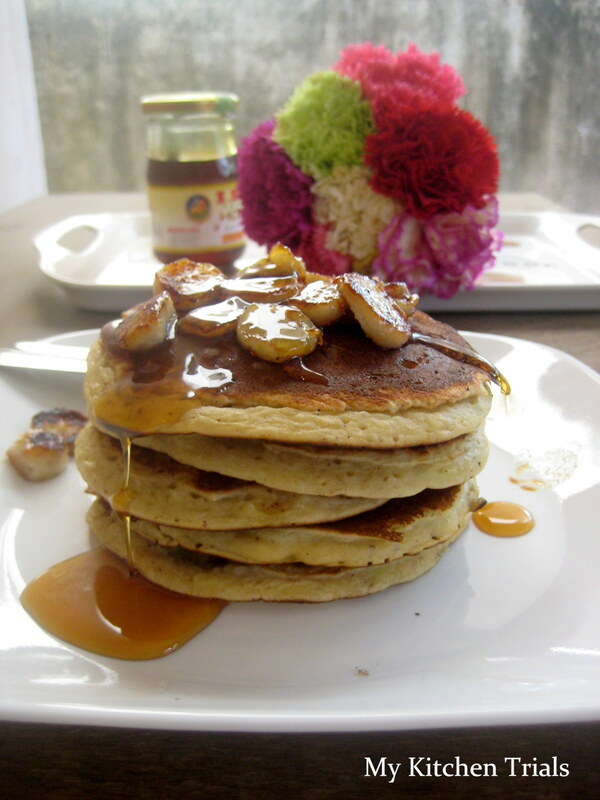 I love banana pancakes…those and pumpkin are my two faves! I can understand your reasons for being late in post and your bf..hahah..lovely shot..